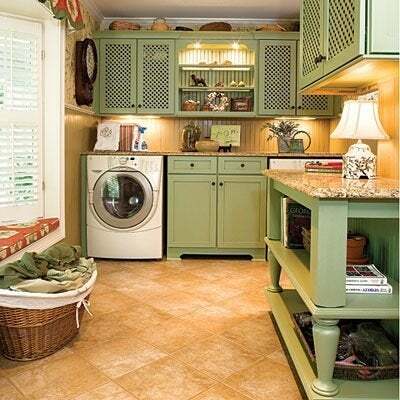 Follow these five tips on your way to creating a more functional and inviting laundry room. Create some counter space. Having adequate surface area for sorting and folding clothes is certain to make your life easier. If you have sufficient floor space, consider adding a center island (similar to one you would select for your kitchen). In addition to serving up a generously sized counter area, it will offer more storage options below. Not enough space in the center of the room? Consider adding a countertop over side-by-side washers and dryers that load in the front. That way, you can be sure you’re making good use of the space and giving the room a custom, built-in look. Maximize storage options. 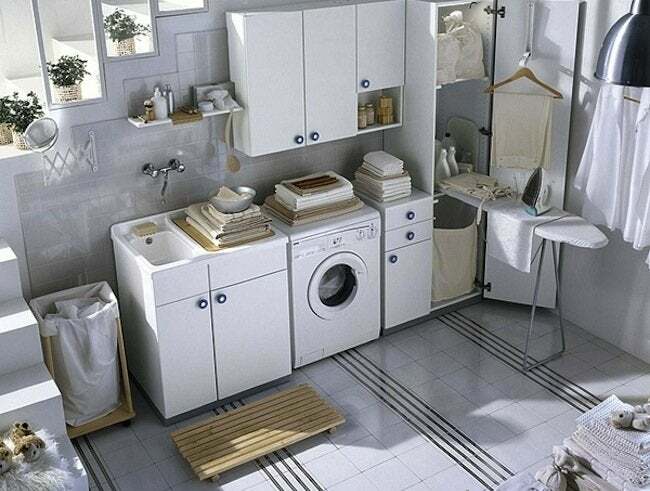 Regardless of your laundry room’s size, there are always ways to add storage options. Any storage will help keep things in their place and, if not out of sight, at least confined and organized. Stock cabinets are inexpensive and can be installed easily. Consider both base- and wall-mounted units wherever possible. If cabinets are not an option, you’ll find a myriad of specially designed products to improve the storage capacity of any laundry room. Upgrade your old appliances. If your existing washer and dryer are old, replacing them with new models will not only make your life easier, but help you save on energy and water costs. Today’s machines offer a wealth of special, high-efficiency features, from larger-capacity washers and dryers to power-foam and steam-cleaning options. Take into account front- and top-loading machines to determine the best solution for your needs. And don’t overlook the option of having a stacked pair; it’s an easy way to open up floor space for a cabinet and counter or sink. Add a sink. If you don’t have a utility sink in your laundry room, investigate whether there is a way to add one. The cost may be less than you think and the convenience of having it for hand-washables and other cleanup jobs will be well worth the consideration. If the plumbing lines are already in place, you can probably do the install yourself.